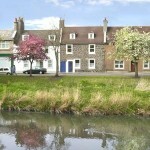 Attractive terraced cottage on 3 floors, built in 1801, facing the river. A warm, friendly, helpful hostess awaits you at this very pleasant stone built terraced cottage located right on the bank of the River Esk. 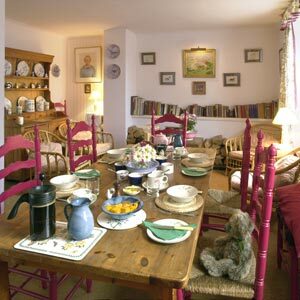 Charmingly decorated and furnished to a high standard, it offers 2 delightful bedrooms and a luxurious bathroom. 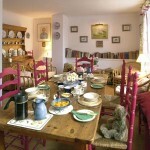 Annie Deacon is a professional cook and takes great care in preparing and serving excellent breakfasts for her guests. The city is a short drive away, or leave your car and go by bus (20 minutes). Minimum 2 nights’ stay preferred. WiFi access. Singles please enquire. 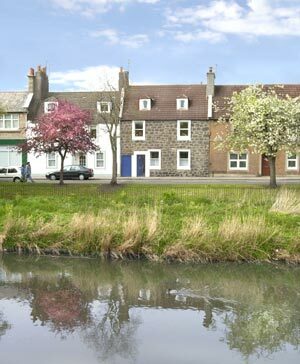 FROM SOUTH OF EDINBURGH: FROM THE MAIN STREET IN MUSSELBURGH, CROSS THE BRIDGE OVER RIVER ESK. TURN LEFT INTO ESKSIDE WEST. COTTAGE IS ON YOUR RIGHT WITH A NAVY BLUE DOOR. NEAR THE ROMAN FOOTBRIDGE. FROM NORTH CROSS FORTH ROAD BRIDGE, FOLLOW SIGN TO CITY BYEPASS (A 170). TAKE BYEPASS UNTIL EXIT TO MUSSELBURGH. AFTER ABOUT 8 MINUTES GO DOWN HILL - WITH RIVER ON RIGHT - TO T JUNCTION & TRAFFIC LIGHTS. TURN RIGHT OVER RIVER, CONTINUE TO NEXT LARGE BRIDGE, TURN LEFT OVER BRIDGE & IMMEDIATELY LEFT AGAIN ONTO ESKSIDE WEST.